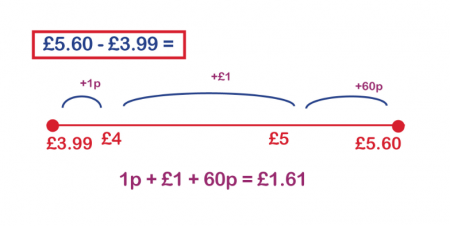 When teaching subtraction, teachers will sometimes use a method called 'complementary addition' that involves putting the smaller number at the start of a number line and then jumping up to the bigger number (another name for the method is the 'jump strategy'). This makes the concept of subtraction being about finding the difference between two numbers very clear. Complementary addition is often taught in Year 3 to make it clear to children that subtraction is about finding the difference between two numbers. 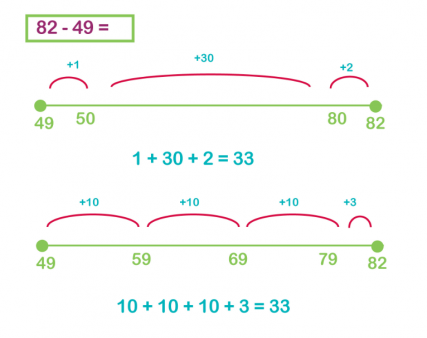 It also helps them to learn to subtract mentally as it makes very clear how many tens and units need to be 'jumped' to get from one number to another. Once children have understood this concept, they often move onto column method for subtraction. 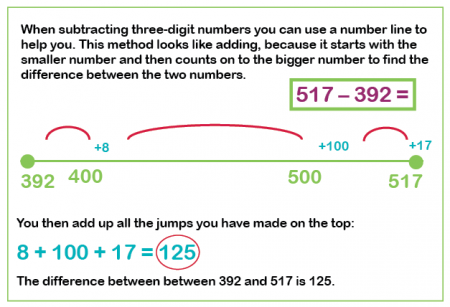 This is a quicker method, but only involves children having to subtract units (not hundreds or thousands), which is why it is important to have practised a more expanded method (like the partitioning method, for example) first.